Daughter of Hope: "I wish I could jump in to the book"
"I wish I could jump in to the book"
Bella, it seems, has joined the ranks of book lovers in our family. 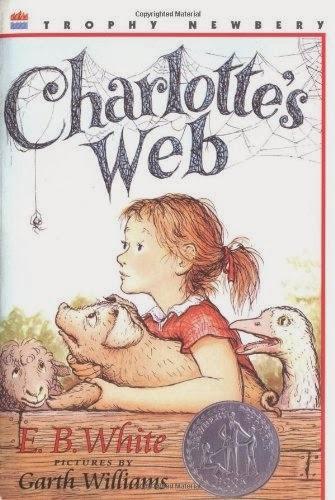 We were reading our chapter of Charlotte's Web tonight for the first time since before Christmas, and she was full of questions about the characters. She tried to visualize the size of the new goslings in her hand. And as she looked at the picture, she said that she wished she could jump into the book. And if she could, she wanted to know what Templeton would do to her (run away) and if the goose would bite her (maybe). We read on, and I wish I had a picture of the look of horror on her face when the old sheep told Wilbur that the farmer was going to kill him. We were relieved to hear Charlotte promise to save him. She has a theory about how that will happen. She thinks that Charlotte might wrap Wilbur in her web to keep him safe, and that she might bite the farmer if he tries to still get to him. I had to reassure her that I believed that Charlotte was very smart and would indeed find a way to save him. I love Bella! And I love her thoughts on the book! That is a wonderful story to read aloud.